Stars like our Sun eject large amounts of gas and dust into space, containing various elements and compounds. Asymptotic giant branch -- AGB -- phase stars, near their end of life, are particularly significant sources of such substances in our galaxy. Formation of dust around AGB stars has been considered to play an important role in triggering acceleration of stellar wind, but the detailed mechanism of this acceleration has not been well explained. And there is yet another conundrum. In space, silicon is ten times more abundant than aluminum. However, many oxygen-rich AGB stars are rich in aluminum oxide dust -- the major carrier of aluminum -- but poor in silicate dust -- the carrier of silicon, which has puzzled researchers: why is aluminum oxide dust so abundant around oxygen-rich AGB stars? 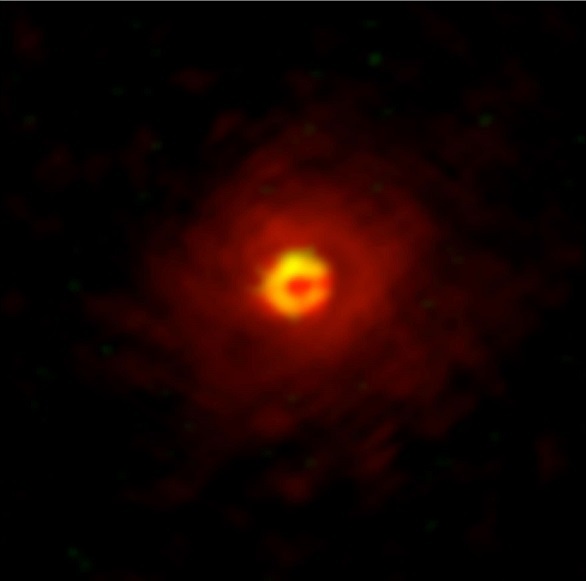 In a paper published in Science Advances, a research team led by Aki Takigawa of Kyoto University have utilized the Atacama Large Millimeter/submillimeter Array -- ALMA, as the high spatial-resolution radio interferometer in Chile is known -- to obtain detailed images of gas molecules forming dust surrounding an AGB star. Professor Shogo Tachibana of the Graduate School of Science at the University of Tokyo (then associate professor of the Faculty of Science at Hokkaido University) contributed to this study. *This research was released jointly by Kyoto University, Graduate School of Science of the University of Tokyo and National Astronomical Observatory of Japan. For more information, please visit the website of Kyoto University.